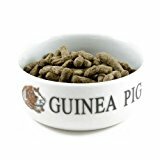 This Guinea Pig Bowl is made from critter safe ceramic, which is easy to clean, heavy enough so that it cant get knocked over and it wont get chewed! Perfect for popping in his favourite treat! This entry was posted in Small Animals and tagged Bowl, GUINEA by One Boutique. Bookmark the permalink.